My love of all things French began in elementary school when an eccentric sixth grade teacher started teaching French to her pupils. She had my full attention as she taught basic phrases and how to count. In my spare time and at recess, I listened to records in French that had conversations that to a 12-year-old sounded other worldly. One phrase I remember was "Je n'ai pas eu le plaisir," which means, "I haven't had the pleasure!" My passion for this romance language intensified during high school where I was lucky to study under an outstanding and outgoing teacher, Madame Sunderland. Madame was the most French person I had ever met -- even though she was clearly American. Her standards were high, and her classes were lively definitely not a class to doze in! You never knew when Madame would direct her gaze toward you and ask you to to conjugate an obscure verb tense or complete the next phrase in a dialogue! Even though I went to the University of Missouri to study journalism, I took a French course every semester, and then spent one of the my most transformative years at the University of Bordeaux. When I left for France, it was only the second time I had ever been on a plane and the first time I'd been outside the United States. I was 20, soon to turn 21, and the Air France flight felt like a glamorous vessel headed to a destiny of my dreams. I got choked up the moment I arrived at Charles de Gaulle, for there was something that made me feel like I was, in a way, at home. Walking the streets of Paris before boarding a bus to Bordeaux seemed to me far from foreign, even though my attempts to speak the language were met with, "Eh???" I think of France every day, so you can imagine how touched I was when I received a package of French postcards in the mail from my dear friend, The Vintage Laundress, LeAnn Stephenson. 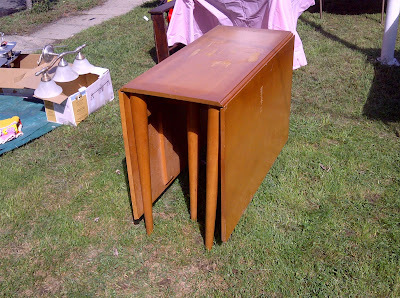 And to that surprise Gift of Thrift, I say merci beaucoup! 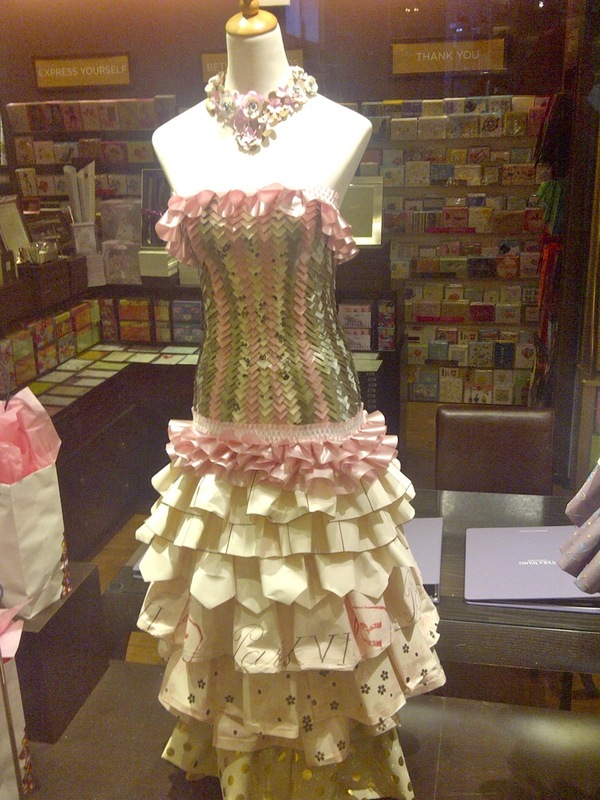 As many of you may know, I'm in the midst of re-creating a 1960s prom scenario for Swarovski's editors presentations. So what's a pretty, frilly prom without pink cocktail napkins to go with the vintage punch bowl I found at a local thrift store? You'd think cocktail napkins would be a simple find, but no. All I uncovered were large dinner napkins in unsavory hues no matter where I looked. Thank goodness for creative friends like LeAnn Stephenson, The Vintage Laundress, in Austin, Texas. Even though she was on her way to Kansas City with her daughter to check out the Kansas City Art Institute, she took time out of her day to pack up all the pink cocktails napkins in her possession and shipped them overnight to me. That's proves much more than The Gift of Thrift --- It's The Gift of Friendship. The Object of My Desire: Keep It Clean! A unified theme in displaying a collection can mean the difference of having a vignette that looks planned and curated and one that belongs in a garbage bag. This arrangement of vintage household products that a friend snapped while in North Carolina is witty and colorful, while also playing up an obsession with cleanliness that can reach battle-like proportions. 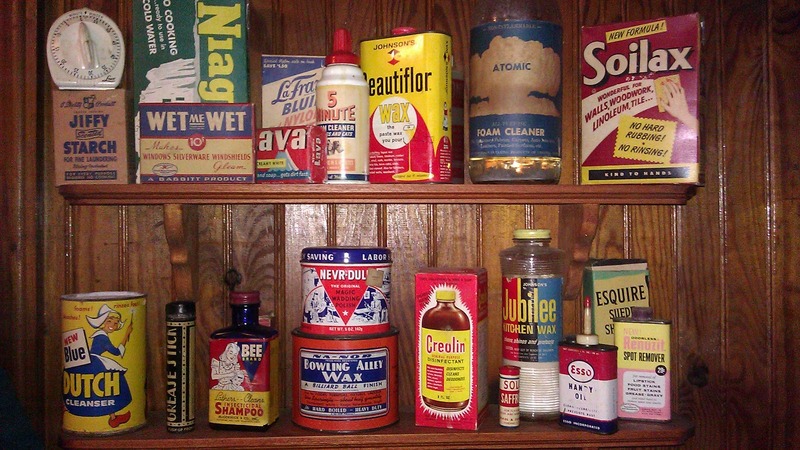 I remember some of these goods, like Jubilee Kitchen Wax on the bottom shelf, from my grandmother's house. Its label suggests a celebratory act of waxing floors. I also remember the Niagara starch, with a cool promise of crisp linens, and Lava, a gritty hand soap that if you weren't careful would not only remove the paint from your hands, but also the skin. On the bottom shelf, there's the Bee Brand of insecticide shampoo, a product I definitely do NOT remember. Kids have lice? Why, turn it into a pleasant bonding experience, thanks to this useful (and probably toxic) concoction. Finally, on the top shelf, there's another container with which I'm unfamiliar, but its packaging speaks to the mood of its times: Atomic -- an ominous foam cleaner whose name implies that it would wipe out about anything anything in sight. I spotted these paper frocks in the windows of a Papyrus store in Grand Central Station. 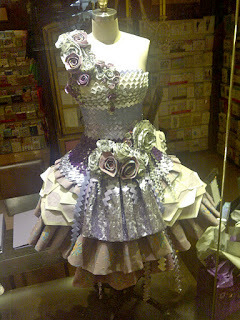 These lovelies are crafted out of an array of paper products sold in the store. 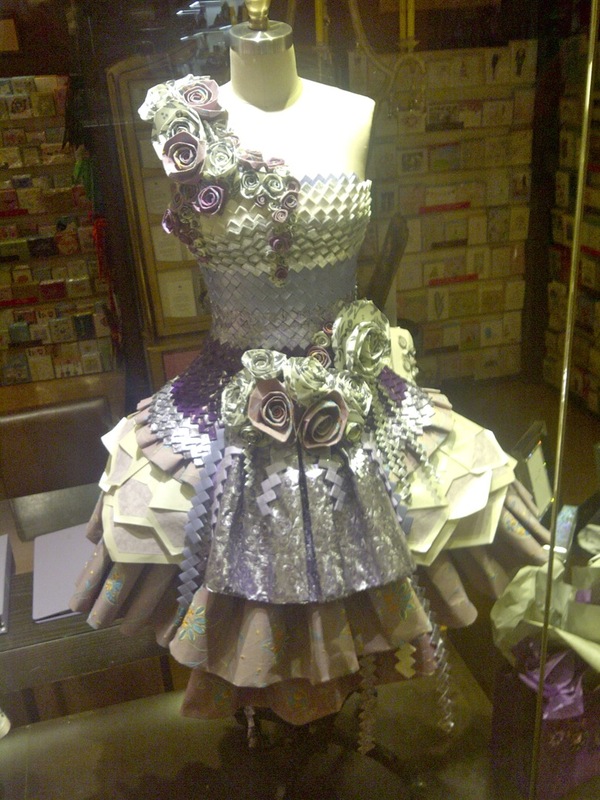 With woven paper bodices and a skirts made of envelopes, I can't imagine these stationery sensations ever getting lost in the mail. 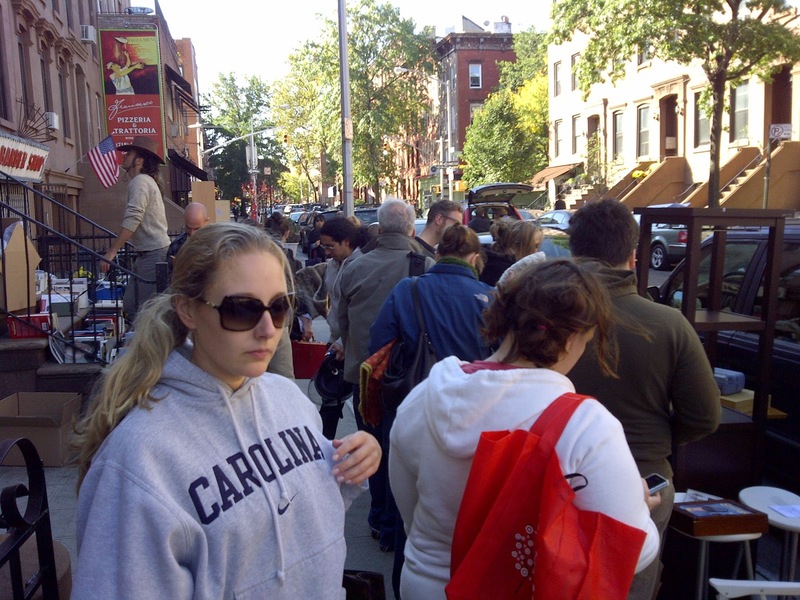 An almost any sunny, fall weekend, you can be sure that Brooklyn will be dotted with stoop sales. 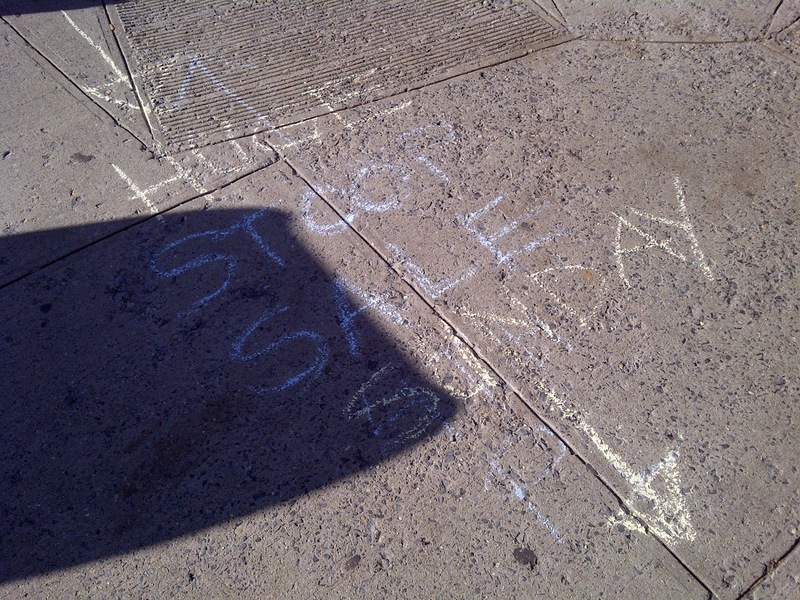 In the Midwest, we have garage sales, and in the East Coast suburbs, they have tag sales, but since space is limited in Brooklyn, people offer their castoffs on the front steps of their homes, and all you have to do to find them is follow the hand-made flyers affixed to poles or chalked-in directions on the sidewalk. 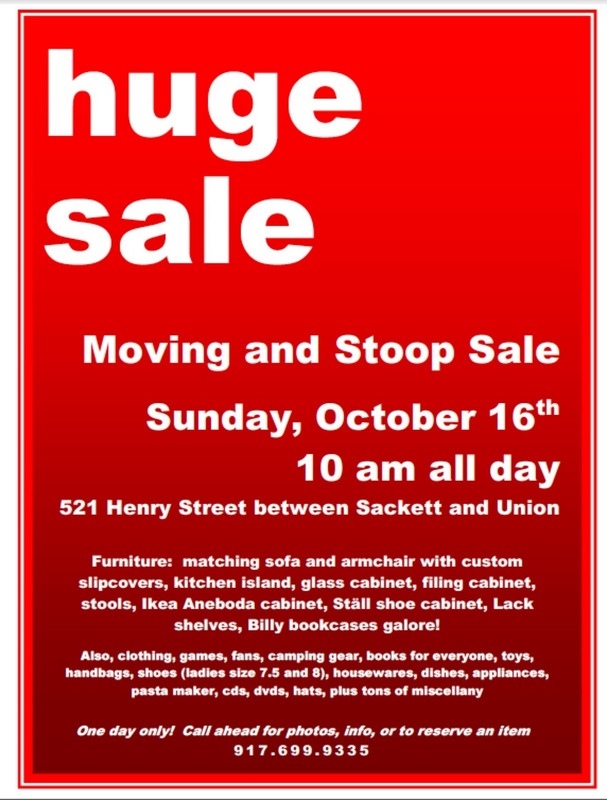 The stoop sale on Henry Street last weekend was a wild success, with most of the goods being sold for between $1 and $5. 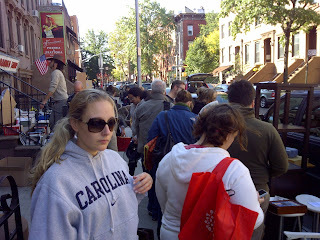 Crowds swarmed even before all the goods were placed out on the street. 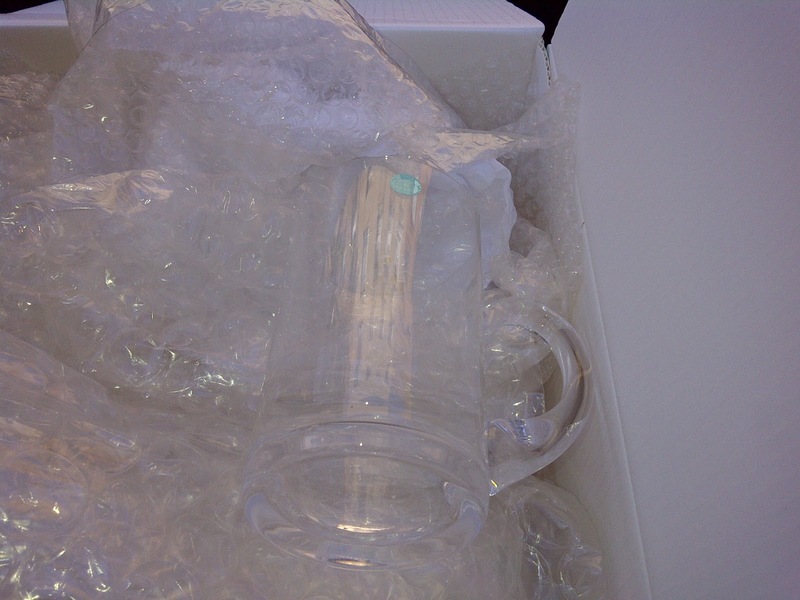 A six-piece set of Tiffany crystal mugs, still in the box, was snapped up for $35. Books, books, books galore. 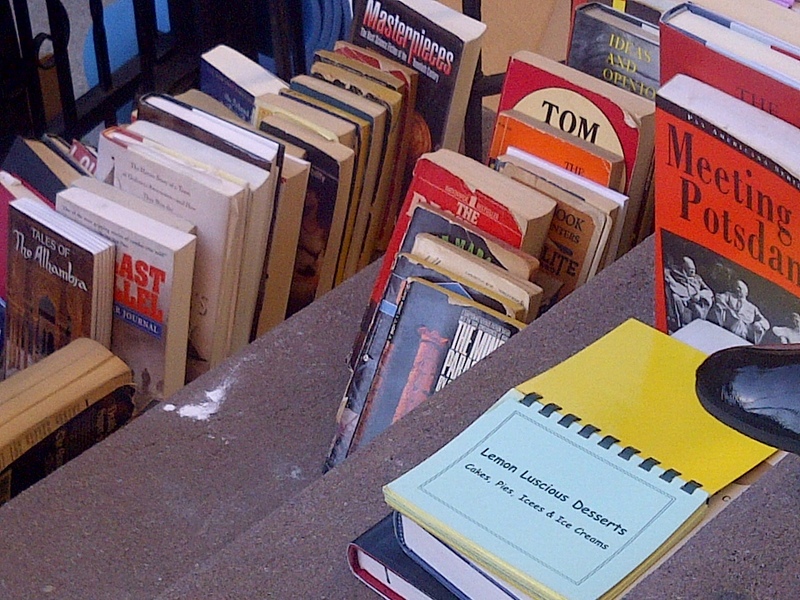 More than half of the books were sold before the end of the day. And when the end came, the leftovers were gathered by the street and labeled free. 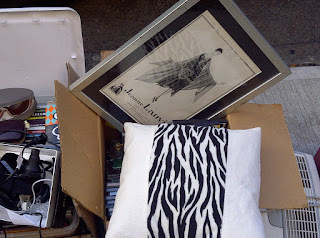 The scavengers descended out of nowhere, but not before my friend wisely Aimée nabbed this framed Jeanne Lanvin ad. 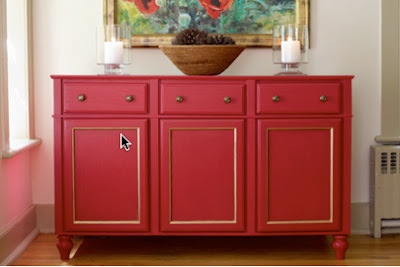 They say imitation is the most sincere form of flattery, and such was the case two-fold when This Old House magazine used The Find: The Housing Works Book of Decorating With Thrift Shop Treasures, Flea Market Objects, and Vintage Details to inspire a cheery, DIY console. 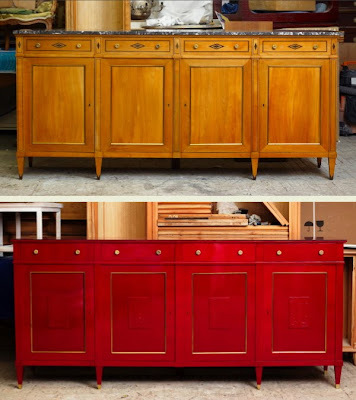 The original credenza featured in The Find was re-visioned by Carl and Co.'s Mark Ciolli for a client who fell for an André Arbus original, but not the $86,000 price tag. Sublime Sundays: Where Am I Today? 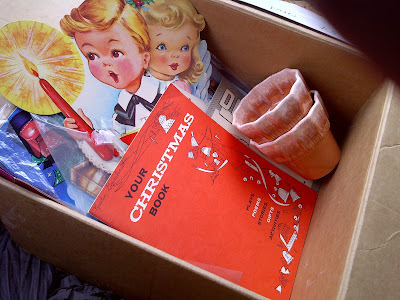 I know a little boy who's getting a little surprise I found at a church rummage sale! For a dime, I picked up this 1959 book that was once part of the Sestauket High School library on Long Island. Are you headed to the pumpkin patch this weekend? 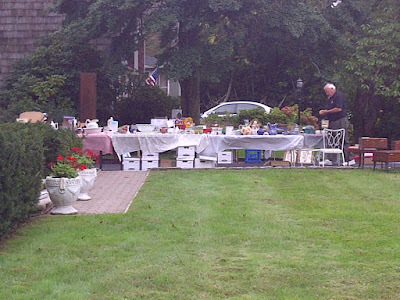 When it comes to shopping yard sales, I'm always charmed by the stories that teachers and former teachers share with me when selling their wares, probably because both of my parents were teachers. My dad, a retired, elementary school principal, used to bring home loads of handmade gifts offered at Christmastime by children and parents. For my sister and me, it was like Santa Claus had made an early arrival, and we couldn't wait to see what Dad had tucked away in all the bags and boxes he brought through the door. Before we were allowed to tear into these goodies, he always made us wait until he could make a list of the gifts he received and the people who offered them so he could send appropriate thank you notes. And I am certain that this orange juice once received a hearty thank you the day it was offered to a favorite teacher. As my attention wandered to this cross-stitched wonder, the former teacher selling it told me that it sat on her desk for probably 30 years. And now that she was no longer working in the school, she was in the process of de-cluttering. 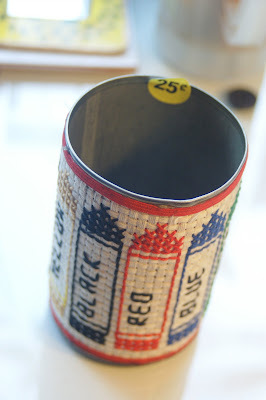 How could I pass up this heartwarming treasure -- priced at 25 cents? It now colors my world atop my own desk. Here's a preview of a fabulous stoop sale that my friend Heather is hosting this Sunday in Carroll Gardens, Brooklyn. It starts at 10 a.m., but you'll want to shop early since there will be all kinds of marvelous merchandise for your consideration, all at unbelievable prices! I was at first attracted to this collection of wig boxes (surprise! ), giving me ideas for all kinds of gift wrapping options. To quote the B-52's: "What's that on your head? A wig!" 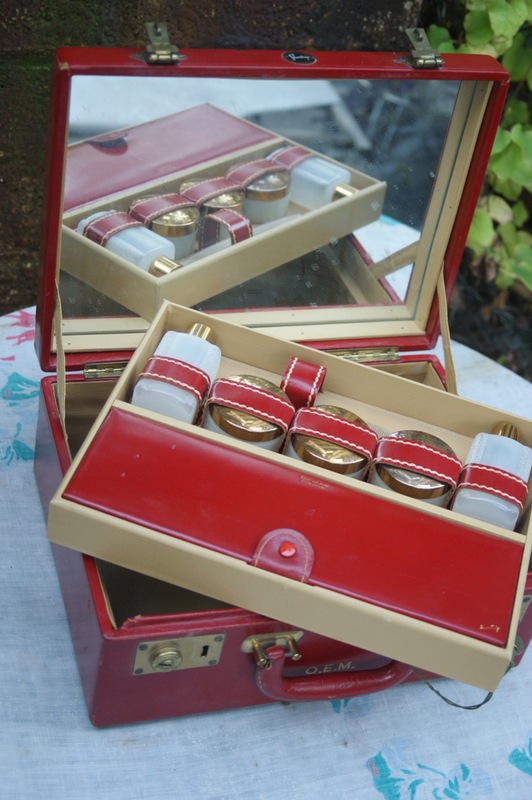 This lovely cosmetics case is in mint condition. If your initials are O.E.M, why, you're in luck! For Mid-Century Modern fans, I can assure you that this Russel Wright creamer will be sold well below Ebay prices -- and fast! This Frye jacket is a in wonderful condition and perfect for this fall's layering options. 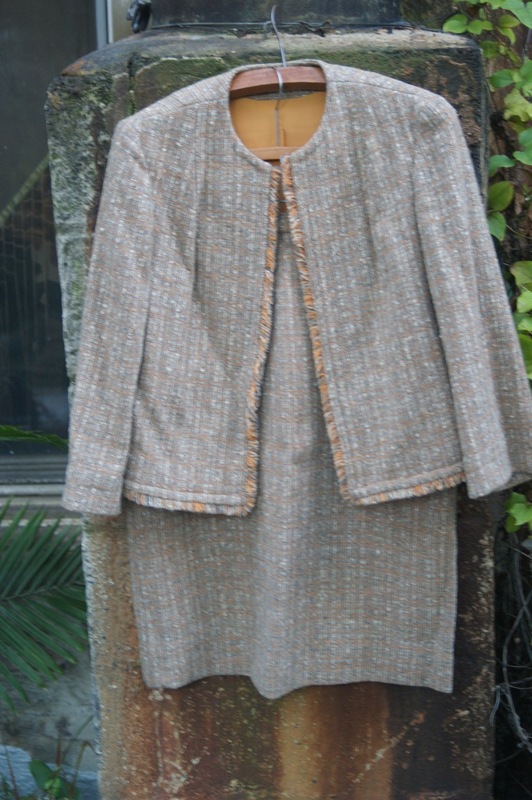 This collectible, made-in-the-USA, Pendleton suit is a size 12 and works well in a professional setting. Get your Halston on with this flirty blouse. Bonus: It comes with a matching scarf! If fur's your thing, glam out in this gorgeous stole. Shimmy and shake! 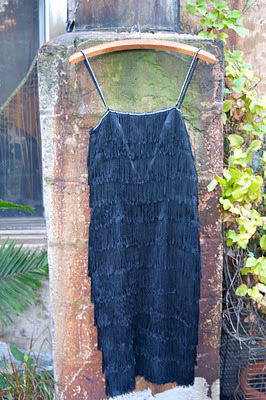 Get your dancing shoes on for this updated flapper number, made in the USA and in a comfy size 9. "Wigs on fire....wigs on fire....wigs on fire!!!" There is so much more, too. And I'll be there. Drop by and say hello! 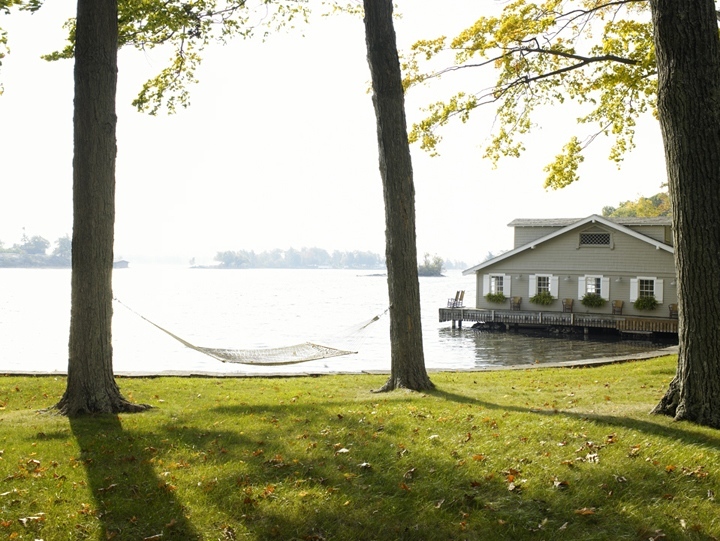 It was four years ago on a day like today that I and a photo crew headed up to the Canadian border to photograph interior designer James "Ford" Huniford's boat house nestled on a private island called Fairyland, one of the Saint Lawrence River's Thousand Islands. 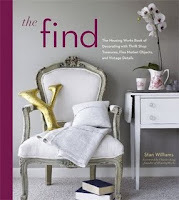 Photographer Jim Franco captured this alluring image for The Find: The Housing Works Book of Decorating With Thrift Shop Treasures, Flea Market Objects, and Vintage Details. The last gasps of summer were still lingering and the hammock set up for visitors when we arrived in a small motor boat captained by Ford himself. And as the autumn leaves were starting to sprinkle the lawn that stretched to the lake, we spent the day taking in his captain's house -- one that today welcomes both boats and guests. 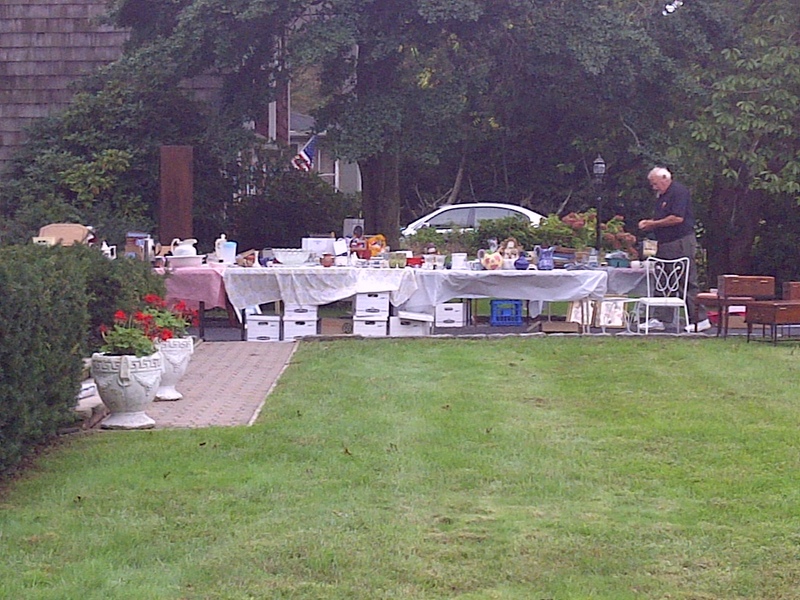 A solid-wood table with a few scuffs all of a sudden dropped its price from $3 to free at a lawn display set up during the Town-Wide Yard Sale in Point Pleasant, New Jersey. Sturdy, but with a few scratches, its legs swing out and its leaves pop up to create a massive dining table fit for a feast. How could we resist? 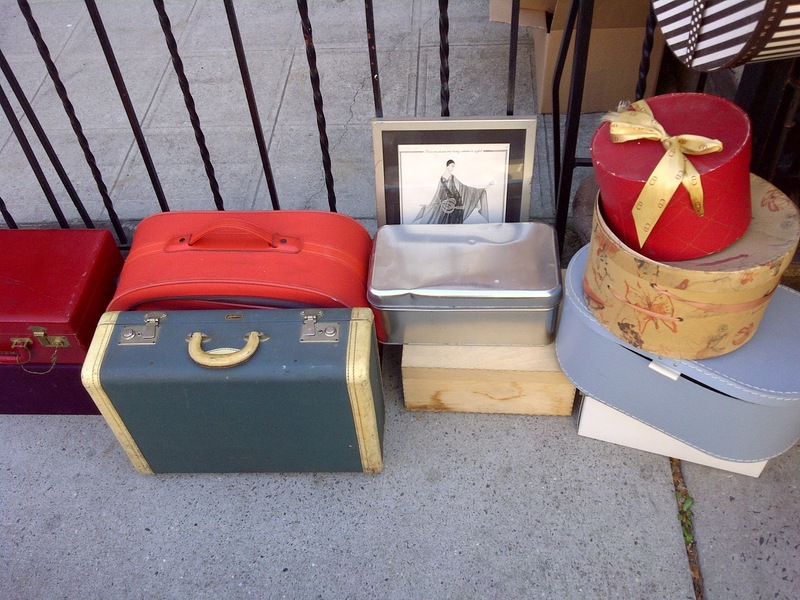 My pals and I loaded it into the Jeep and hauled it back to New York City for a friend about to move into a new apartment. Do you have a fabulous find that cost you absolutely nothing? 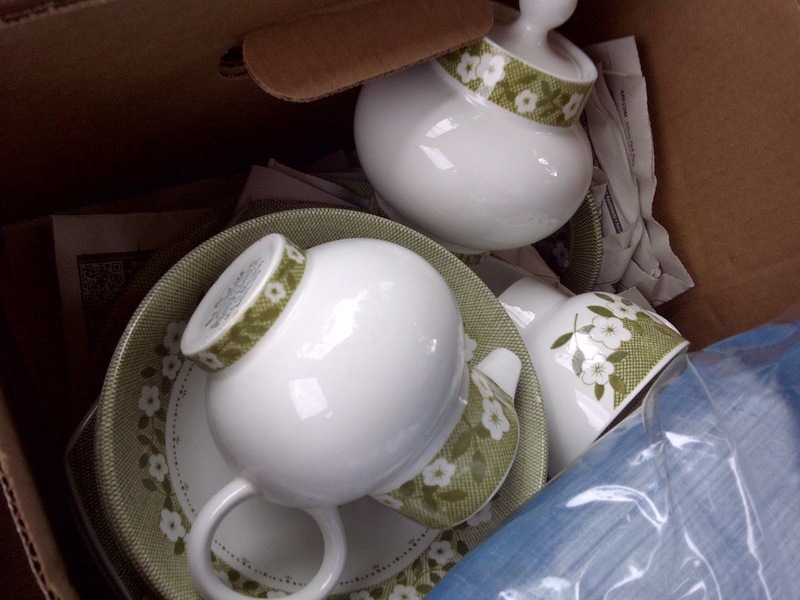 For $5, a box full of J & G Meakin English china. Actually, I didn't buy it, but coerced my pal Michael Quinn to cough up for it. 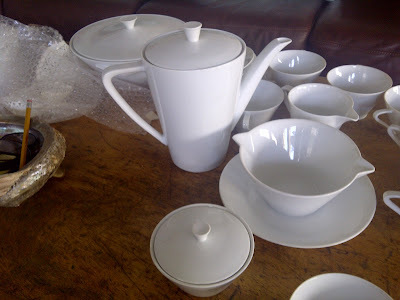 For $10, this gorgeous set of Mid-Century porcelain. 8 plates, teapot, serving dish, gravy boat, and more! I about passed out. Even though there are no markings, it's a beautiful set that seems to have never been used. One lovely lady, a retired school teacher, wanted me to make my own $5 box of vintage Christmas goodies and threw in these two, salmon-colored pots marked U.S.A. 41. Of course, I couldn't refuse. 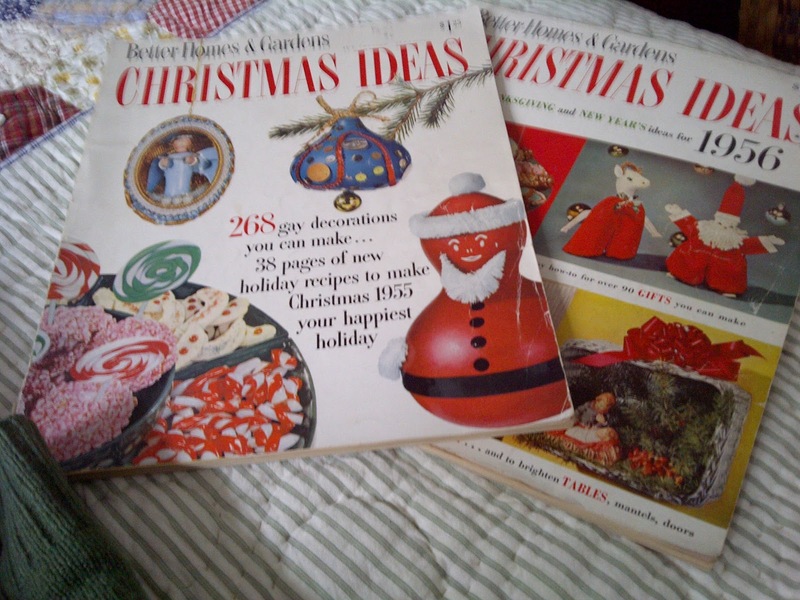 Hidden in the bottom of this $5 treasure chest were these two volumes of Better Homes & Gardens Christmas Ideas from 1955 and 1956. "268 gay decorations you can make...." How could I resist? After two full days of thrifting at the Town-Wide Yard Sale in Point Pleasant, New Jersey, I was reminded of this wagon-load of Christmas ornaments photographed by Jim Franco for The Find: The Housing Works Book of Decorating With Thrift Shop Treasures, Flea Market Objects, and Vintage Details. Even though this image from the Alameda Point Antiques Faire near San Francisco never made it into the pages of The Find, I'm always drawn to this photo for the way simple objects can be transformed into a dazzling presentation. 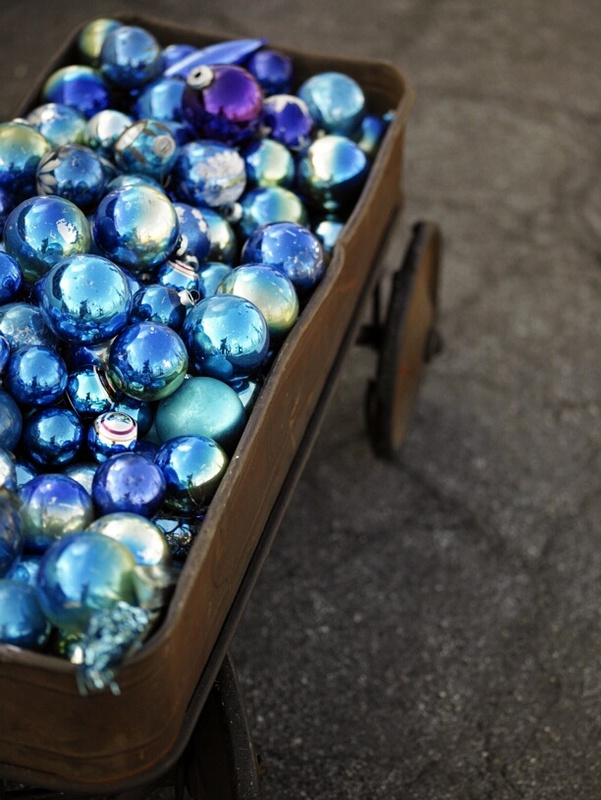 This rusty children's toy instantly gained new life when heaped with shimmering ornaments. 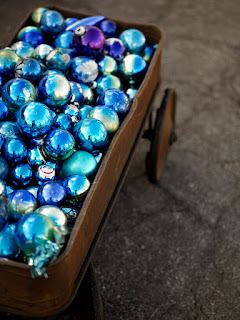 It called for attention among all the other treasures on display that day, suggesting that the idea of a blue Christmas might not be so bad after all.